The stained glass window is set at the rear of the Sanctuary directly in line with the center aisle and directly opposite & complementing the Cross which is placed over the altar. It is clearly visible when leaving the altar or leaving the Sanctuary. The orientation is to the east-northeast. During morning worship, sunlight directly illuminates the window. Inside on the floor, and immediately below the window, is polished ceramic tile. The filtered sunlight reflects from the floor and provide unique lighting accents at the rear of the Sanctuary. At night, when the Sanctuary is not occupied, lights illuminate the window so it can be seen from outside. When there are evening worship services, lights on the inside illuminate the window so full details are visible from the inside. Outside the window is a low growing meditation garden with seating. 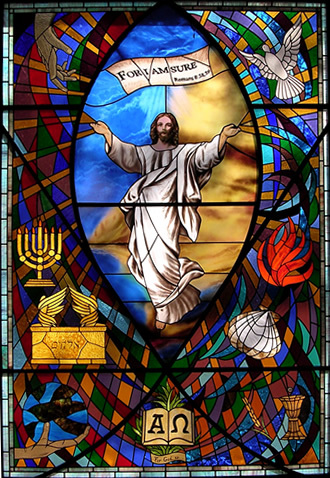 Paula Ryan, of Art Glass Studio in Savannah, GA designed the window based on a theme established by Trinitiy Lutheran Church. Because this is a very large stained glass (9' x 13'), the window area is divided into smaller sections, each bounded by major structural elements that have become symbols. This provides the support to the glass ensuring structural integrity. The window frame was installed in the Church in February, 2003. The polycarbonate panels were installed in April 2003. The stained glass panels were installed in January, 2004 following completion of the Church. Cathedral glass of varying tints and texture were used. Silica of varying colors was applied to the glass to selectively change the tint of the basic glass and/or to form the individual symbols and Christ's image. The glass with silica was fired, thus permanently fusing the tinted silica into the glass. From the outset, it was decided to show an "image" of Christ in a classical fashion. The image of Christ as The Risen Lord was chosen. The size is 5 feet 6 inches; this is thought to be about the actual height of Christ. The coloring and cloud-like setting clearly communicates that Christ was/is both God and man! The image shown has Christ with outstretched arms and hands open downward blessing the people. The eyes are also looking at the people. The imprints of the nails are shown. This is the main "impact" message of the window. That is, as one looks at the window either for the first time or after many times, the fact that Christ died and rose for us is immediately communicated. This is the message that everyone who leaves the altar following Communion and/or leaves the Sanctuary following services will experience. "For I am persuaded, that neither death, nor life, nor angels, nor prinicpalities, nor powers, nor things present, nor things to come, nor height, nor depth, nor any other creature, shall be able to separate us from the love of God which is Christ Jesus the Lord." In the tail of the FISH is an open Bible. In early times, the average person could not read. As such, the Bible was generally "closed". Since the Bible has been translated into numerous langauges, thanks to Martin Luther and other Bible translators, God's Word has become widely accessible in languages spoken and read throughout the world. The Bible has thus been "opened". While there are a number of symbols that have come to represent God, four have been chosen for this setting. They are portrayed in a more contemporary manner. This was influenced by the contemporary design of the Church building. It is a way to bridge the classical presentation of the Risen Lord with a contemporary building. The open hand of God, extended and reaching downward from a cloud signifies His calling us and His generosity in giving us all we need. No attempts were made to give a visual representation of God. "You cannot see my face" God said to Moses. A hand was the first symbol used to represent God since it was the hand/fingers that made the heavens and the heavenly bodies. It also reminds us that the heavenly Father's hand reaches out into our lives, guiding, guarding, blessing, and supplying all of our needs. It is not only to Christ that the Seven gifts of the Spirit are given; believers too, receive them. The Ark of the Covenant was literally a chest. It was made of shittim or acacia wood and covered in pure gold both on the outside and inside. On the top was the Mercy Seat (a crown) also in pure gold. Two cherubims of gold forged into the proper shape were a part of the top. The cherubims faced each other looking downward toward the Mercy Seat. The wings were spread out and touching at the tips. Inside the chest and directly below the Mercy Seat were the tow tablets on which the Ten Commandments were inscribed -- the terms of God's covenant with Israel (meeting place of Law and Mercy -- a shadow of Christ). Superimposed on the glass panels representing God (as well as those panels representing the Holy Spirit) are curved lines. Those lines represent "Blessings Coming Down" and "Prayers Going Up". While there are various colors spanning the spectrum, red is seen to be only on the side representing the Father. This color symbolizes the blood shed by His son. Numerous symbols have come to represent the Holy Spirit. Like the symbols representing God, they are more contemporary in nature. Note the lines curving down/up superimposed in the panes. The DOVE (turtledove) was one of the birds that could be used as a sacrifice. It was also the harbinger of Peace. The Dove is recognized as tender and gentle. It has generally been symbolic of the Holy Spirit because a Dove hovers upon descent like the Holy Spirit descended upon the Savior at his baptism. 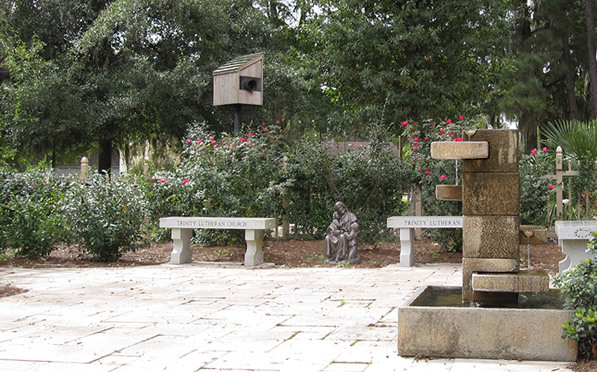 All four gospels refer to the Spirit descending as a Dove. Flame represents the Lord's Presence and brightness. The SHELL with water dripping from it is a traditional symbol for the baptism of Jesus. Shells (or replicas) have been used more and more to pour water at the time of Baptism and thus have become a symbol for Christian Baptism (that of Jesus and us). Three drops are often depicted with the shell and serve as a reminder that we are baptized into faith in the name of the Father and the Son and the Holy Spirit. The CHALICE and wafer (Host) call to mind the blood and body of Christ. The wafer reminds us of the unleavened bread prepared by the people of Israel in anticipation of their flight from Egypt. The relationship between the Passover and the Lord's Supper is evident in this symbol. GRAPES and SHEAVES of wheat are familiar Christian symbols representing the Sacrament of Holy Communion, the grapes indicating the wine and the wheat indicating bread. The chalice and ciborium, containers for those elements, also symbolize Holy Communion. The bread is often in the form of wafers, sometimes called "the host". All believers who commune receive the grace, which Christ has merited, the strengthening of their faith, the forgiveness of sins, and continual Christian growth.